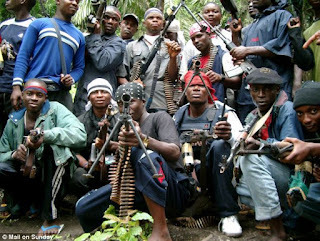 A militant group known as the Adaka Boro Avengers, ABA, has called on indigenes of Niger Delta region to return home ahead of the declaration of Niger Delta Republic on August 1. ABA which claimed to be working alongside other militant groups in the region has recently issued a threat to declare the oil rich region a republic by August 1. Diete Spiff; Ankio Briggs; Joseph Eva; Patrick Fufein, Pastor Good, past and present military personnel from the region, present senators and members of the Houses of Representatives to be present at the official declaration of the Niger Delta republic on August 1. The statement reads in part, “We are also using this medium to call on the Niger Delta famous sons and daughters. Pa E. K. Clark, King Alfred Diete Spiff, His Excellency Dr. Goodluck Ebele Jonathan, Ankio Briggs, Joseph Eva, Patrick Fufein, Pastor Good, the children of late Pa Isaac Adaka Boro, past and present military personnel from the Niger Delta region. “Past and present governors from the Niger Delta, past and present senators and Houses of Representatives members.